This time of year presents problems, sartorially. At least in Virginia where the mercury is… well … mercurial to say the least. Awaken to temperatures in the 40ºs (F) and by lunch it is close to twenty degrees warmer. And if you commute by car, leaping in and out whilst wearing your topcoat can get annoying. Even a carcoat becomes a burden later in the day. I remember those crowded and steamy Metro rides into the District back when I was gainfully, if not well-, employed. But I soldiered on, ending the day with my coat draped over my arm and praying for a seat. That’s when I should have turned instead to a hat, a scarf and gloves. All of which could be chucked into the shoulder bag at the end of the day. On a brisk morning, the even brisker walk would have kept me warm enough and the scarf would have provided the extra layer of material against my chest. Yesterday’s choice was a silk scarf from the 1930’s that belonged to my grandfather, who was about as sartorially resplendent as a Maryland State Trooper could get. But it was the Golden Age of menswear when everyone aspired to elegance. I also have his Optima Crown Panama purchased in Havana, Cuba in ’58-’59, a wash and wear dinner jacket for travel, over the calf motorcycle boots and a bowler/derby/Coke hat purchased in New York City. How many men, let alone cops … well anyway. The silk scarf is the lightest of the dress scarf choices, particularly if it is doublesided and not backed by wool or cashmere. It is still surprisingly warm, but that is the nature of silk and why I recommend silk base layers during winter. Silk is also luxurious to wear and so a good companion to the more casual blue-grey windowpane flannel suit seen above. I debated about the gloves, grey suede? Yellow chamois? But stuck with a traditional dark brown calf lined in cashmere to serve as a counterpoint to the chocolate suede shoes and the alligator watch strap. A hat, should I have worn one, would have also been brown. The combination of gloves, the flannel suit and the silk scarf kept me very comfortable throughout the day, from car trips to a three block walk to my tailors. If elegance is simplicity, the silk scarf and gloves qualify as one of the easier way to achieve it. And this is the easiest way to wear them both. This entry was posted in Elegantology and tagged Bowler hat, Coke Hat, Derby Hat, Elegantology, Havana Cuba, New York City, Optima Crown Panama Hat. Bookmark the permalink. Love the silk scarf. There’s a great scene in “The Bishop’s Wife” where Cary Grant (Dudley) wears David Niven’s (the Bishop) scarf when it’s offered to him by the maid (Elsa Lanchester) Apparently the Bishop doesn’t wear scarves, gloves, etc. Perhaps, the really greatest scene is when the Bishop opens Dudley’s collar and notices his own scarf being worn by the angel/man who is attracted to his wife. In any case, Cary looks wonderful in the scarf and topcoat. As I think you know, I love gloves and carry a pair all the time–except during the warmer months. Unlined at this time of year, cashmere or shearling lined as the winter picks up. I love knit glove and scarf sets when I am not the driver–perfect for when I am out with my husband, especially to the movies or a restaurant, or even a friends house that keeps their thermostat down. And I always pack a silk scarf when I travel, along with a pashmina shawl, even though the fashion police at Vogue have deemed pashminas passe. Question: Do you wear the bowler very much, and if you do, whats the typical reaction? I like the look of a bowler, but I’m trying to avoid looking like I’m wearing a costume. I love scarves of all kinds, all year round. This season I like to layer, and scarves are part of all of my ensembles. As always, you look just like the new man I want in my life. I found last year a pair of gloves made in a thin calf leather. for guys (I m a man ) the look is terific, specially with an over coat. 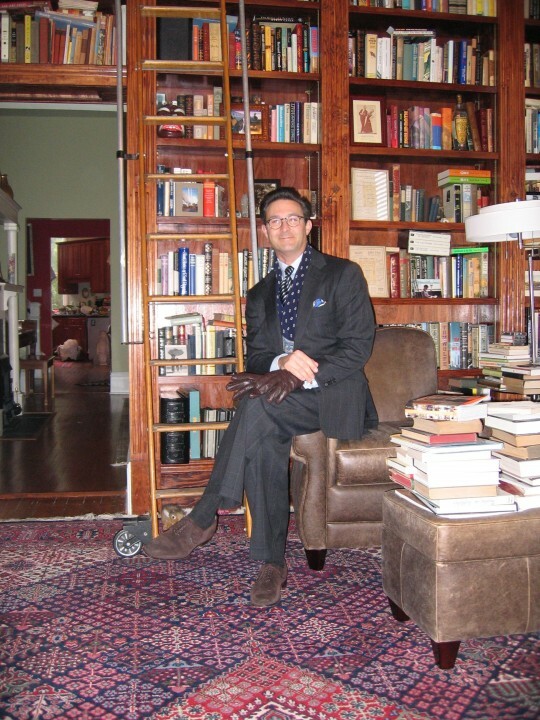 Welcome Claude, I sometimes wear a vintage pair of grey suede, or white or yellow gloves. I agree, they are a nice change. I’ve been looking for a scarf just like the one Cary Grant wore in “The Bishop’s Wife.” Where can I find it? Hello Mr. Crosby and welcome. I have too. The real deal is made in England. I believe that Drake’s may carry it. Or Hackett. They are expensive. Square with Flair once advised me to get a piece of silk from a fabric house and have the seamstress at the laundry put a handrolled and stitched edge to it. I have yet to find the perfect dot. When I do, I will follow SwF’s advise and be very happy.